Makeup that goes with red hair will accentuate your features. Although red hair is obtainable in a bottle or a jar, natural redheads make up only about 2 percent of the population in the United States. Natural redheads usually have orange-red hair, strawberry blond hair or deep auburn shades of hair. Redheads also typically have lighter skin complexions and sunburn easily. Oftentimes, redheads have freckles, and the undertones in redheads tend to be blue, yellow, or pink. Typical colors for red heads include forest green, taupe, or shades of brown for natural looks. 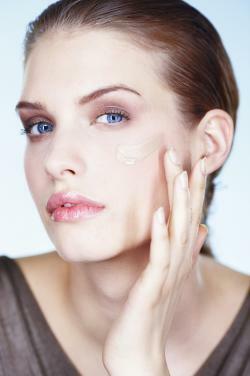 Choosing a foundation for your undertones may be challenging. Ladies with red hair and fair complexions should make sure that the colors that they choose are not too dark. Apply the makeup in bright lights or in the sunlight if it is possible, and make sure that the makeup is appropriate for your undertone. Ladies with pink undertones, however, should be aware that choosing a foundation with too much of that undertone will make you look redder. Too much yellow will not be flattering. You don't want to use foundation to drastically change your complexion, you want it to enhance your complexion. So, you may have to mix colors and test them out. You can also get a personalized mix from a company like Prescriptives, or try shopping with companies that cater to redheads. If you have freckles, do not try to cover them up with your foundation or a concealer, as this can look unnatural. Instead, embrace your freckles. Eye shadow shades for redheads can range from soft neutral browns to green. Deep browns with hints of red, like a brownish-brick red for the crease of the eye works well for redheads. A neutral tan can be placed on the lids or under the brow as a highlighter. If you are craving a little sparkle, use metallic gold sparingly. Under the eyes and on the lid to line the eye, avoid black, and opt for a brown or rust shade. Use brown mascara to bring out the color in your eyes. For a natural look, choose neutral lipstick in brown shades or extremely light, barely-there pink. Colors like bright cherry red may clash with redheads with orange-red hair, and bright hot pink can also clash with many red hair colors. Look for a color similar to a deep rose-red or dark pink. You can also choose a color the mimics the natural pink in your lips. Because natural redheads usually have fair skin, the blush may be the easier makeup shade to find. Look for a color that matches your own natural blush. Usually, it will be a color that is in the same family as your lip color. Try using pinks or rose colors. 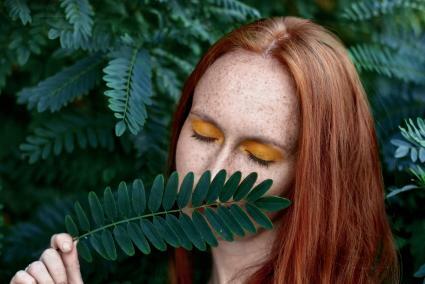 For products that are especially designed for redheads and for makeup that goes with red hair, consider using Just for Redheads, a makeup line developed for redheads by a redhead. The company has a wide range of colors for redheads. If you are having trouble choosing a color, you can ask for personal help, sending a written description of yourself to Just for Redheads.